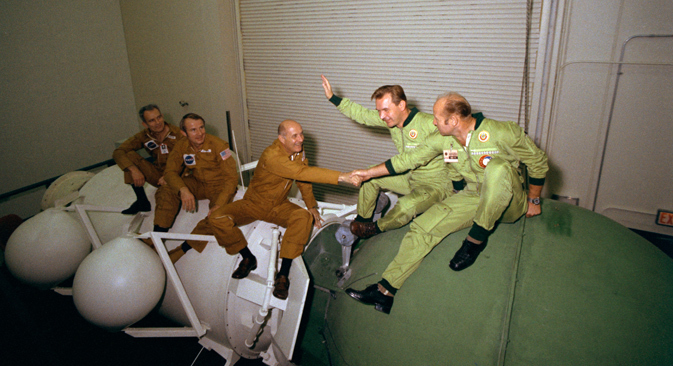 The Apollo-Soyuz mission that was the beginning of international cooperation in space turns 40 in 2015. By 1975 the USSR and the U.S. had been traveling into space for nearly 15 years, yet could do little to help each other in cases of emergency. The first joint space mission involving two different states began with the launch of a Soyuz-19 rocket from Baikonur Cosmodrome and an Apollo rocket from Cape Canaveral on July 15, 1975. The idea of the joint space mission was proposed by U.S. President Richard Nixon. The Soviet Union and the U.S. were to practice docking and adapting their radio communication systems to be able to assist each other in the event of an emergency. On the evening of July 17, 1975, the Soviet Soyuz-19 spacecraft carrying Alexei Leonov and Valery Kubasov docked with the American spacecraft Apollo-18 with Thomas Stafford, Vance Brand and Deke Slayton onboard. This was the first space station involving multiple countries and an early predecessor of the International Space Station, which was launched in 1998. In the 1960s, all interaction between Soviet and American space scientists was limited to meetings at international conferences. The USSR and the U.S. first discussed a possible docking of their spacecraft in October 1970. Two years later, the two countries signed an agreement for a joint space mission under the Apollo–Soyuz Test Project and commenced work on it. For the first time ever, Soviet and American scientists and astronauts trained not only at their home base but at their partner’s location too. There were numerous difficulties caused by the language barrier and various restrictions because many of the plans were top secret. However, after docking the ice was broken. On board, the two crews soon found things in common and even joked around. For example, right after the docking, when the two crews gathered together, Soyuz captain Leonov presented everybody with a tube with the word “vodka” inscribed on it. He told his fellow astronauts that it was to be drunk before the meal according to Russian tradition. The Americans were unsure of what to do at first, as drinking alcohol was against protocol, but they ultimately agreed. However, instead of vodka, the tubes were filled with the traditional Ukrainian soup borscht. Leonov had personally placed the false labels on the tubes before the flight. When the Soyuz was already mounted on the launch pad, it turned out that its onboard television system was out of order. Mission control instructed the cosmonauts how to fix it when they were already in orbit. They ended up working through the night. It later turned out that the Americans spent a sleepless night, too: they had to deal with a docking pin that had got stuck, which could have prevented the astronauts from moving from the Apollo to the Soyuz. Therefore, the historic meeting was very close to being postponed. However, the two crews worked through the night and managed to fix all of the problems in time. The experience and superior training of the two crews were enormously valuable. Leonov, the captain of the Soviet crew, was the first man to conduct a spacewalk while traveling on the Voskhod-2 in 1965, while Apollo captain Stafford was making his fourth journey into space after having orbited the Moon numerous times. During the Apollo–Soyuz Test Project, the two crews successfully coped with all of the program’s tasks: they docked the two spacecraft, practiced moving from one spacecraft to the other, established interaction between the two mission control centers and conducted all the planned scientific experiments. “The handshake in space,” as the Apollo-Soyuz mission is often called, became one of the most significant political events of its time and marked the beginning of cooperation between the two leading space powers.